Accommodates up to 4 incoming phone lines with 10 outgoing lines for each line. 1” standoffs allow the DD3x3 to sit off the wall allowing wiring from the back for a clean organized appearance. 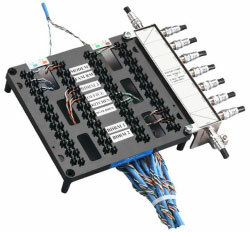 8-way 2050MHz (2Ghz) splitter for CATV cable runs. Internally bridged and NO bridging clips needed. Modular design for adding components as needed. A very economical structured wiring device. DD3X3K DD3X3 WITH THE 110 PUNCH/PUSH DOWN TOOL. DD3X3CK DD3X3 WITH COVER & 110 PUNCH/PUSH DOWN TOOL.